Of all the various types of jealousy that fuel the art world, there are two that cause the most problems. The first is the one you feel when someone you know is in a show that you would have liked to’ve been part of, but weren’t (or they’ve been given an award or a grant, or have gotten a good write up…). This tends to make you feel left out, and then Wrathful. For a few short hours, at least. Because after a few hours, you calm down, and realize that both the other artist and the gallery (or the grant people, or the journalist)—that everyone concerned is just plain stupid, and that you’re much better than they are. All of them. This calming down usually involves telling other people about how stupid the other artist is; and your jealousy melts away into an uneasy sense of verbal superiority. The second type of jealousy is a little less vocal. It’s the jealousy you feel when an artist you know or admire creates a work of art that you wish you’d done yourself. This one is the more painful of the two, because you can’t find anything to criticize. And because you can’t tell anyone about the piece, because you don’t want to help the other artist out by publicizing this perfect work. And so, all bottled up in your throat, your jealousy lives on. Sometimes, for a long long time. My feelings of jealousy towards the League of Imaginary Scientists, for example, have been making solid food hard to swallow for well over a year now. Coming up on two, in fact. The specific piece that rankles me is their Childhood Machine. 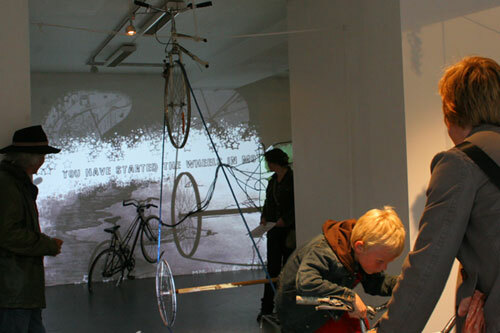 The Childhood Machine was a hugely imaginative piece that lived a brief few months in Trondheim, Norway in late 2007. Alternatively, if you take the project at face value, it is a permanent piece that has, and will always live in Trondheim, Norway. Beyond all this, in one corner of the gallery, was the specific slice of genius that’s kept me up, perfecting my tossing and my turning, and teaching my face to wrinkle. On two walls of the gallery was a horizontal black line. Above and below this line were post-it notes, left by visitors. And on these post-it notes were childhood memories, arranged in the best chronological order that the writers themselves could arrange. In this corner was an archeology of an entire town’s childhood memories. As I mentioned before, the installation was created by the League of Imaginary Scientists. The League is the brainchild of Dr. L. Hernandez Gomez, which is the alter ego of an LA-based artist who also goes by the name Lucy H.G. The League itself is an ever-shifting group of collaborators, who gather together to create elaborate and whimsical installations and participatory events. This particular project was created by Hernandez Gomez, with the help of artist Matt Solomon from Los Angeles, artists Anne Helga Henning and Pol Buyesen of Trondheim, with remote engineering by Jeremy Schwartz and Steve Shoffner in Los Angeles and sound by Imaginationandmymother in London. I’d really hoped by sharing this with you that I’d feel a little less jealous. That by analyzing the project again, I’d find some little hole in the cloth to poke my finger through. It really didn’t work.